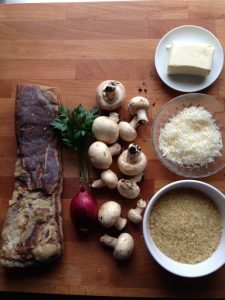 To start making this amazing risotto you will need solid ingredients but also very important part is the broth (or brodo how we call it in Italy). When I have the time I make traditional broth (chicken, fish, beef or veggies based) and then I freeze them and use them when I need them for cooking. If you want delicious broth recipes I use, click HERE. However, yesterday risotto with mushrooms was last minute idea for dinner and I didn’t have any precooked broth so I did a little shortcut. I used Knorr cubes (there are several versions) and I made clear broth in few minuter. Chop the onion into thin cubes. Not to big or too small. I believe everybody has it’s own perfect size that they prefer. Then chop the smoked bacon. The one I’m currently using has been salted and smoked by my parents and it has this incredible rich aroma. However, during the year I also purchase little portions of precut bacon in the supermarket and it works well for me too. 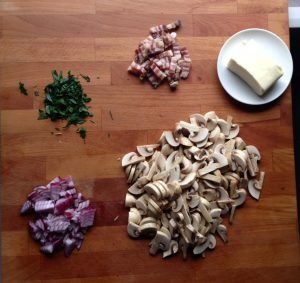 Cut the mushroom in two and then make your thin slices. TIP: you should never wash mushrooms. The dirt you might get on mushrooms only needs to brushed off. If you don’t have a little brush use paper towel to rub the dirt off. Now that you have all ingredients chopped it time to start cooking. Did you notice a chunky piece of butter on my first and second photo? I typically use it twice when making risotto. On the beginning and on the end. Well, in Italy we often mix a extra virgin olive oil with a bit of butter in order to get the ideal taste. 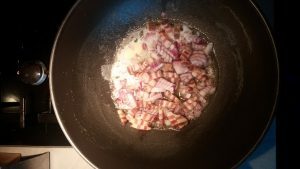 Put the onions and bacon together in the hot pan. 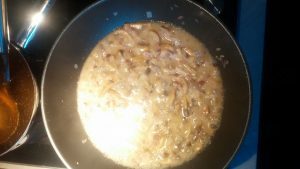 Bacon will release the bits of grease and onions will soften till perfection. I usually cook risotto on low to medium heat, so that all ingredients would cook well, but not too fast in order to burn. Once you see that onions have become transparent we move to third phase. 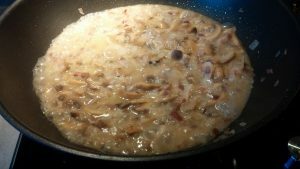 Add your mushrooms on the bacon and onions and stir. Mushrooms will release its liquid and will soften after several minutes only. Stay close to the stove and stir occasionally and cook on medium heat. In this step your broth should be boiling and ready to use. Can you see my broth cooking on the photo? I usually have 2 – 2.5 liters of broth for 2 – 3 portions of rice. So, I’m half way done. 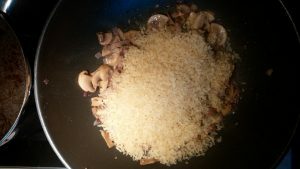 Let’s add the rice into my yummy risotto with mushrooms. Stir the rice with the rest of ingredients and let is heat up for a minute. Keep stirring so that ingredients would combine well and to make sure nothing burns. Once the rice get’s warm (touch it) add your first scoop of broth. Cover the rice with the broth and lower the heat to minimum. Stir occasionally. Make sure that rice is always “swimming” in the broth in it’s initial cooking phase. As you have been cooking it for 5-6 minutes, you will notice that rice has released it’s starch. Releasing the starch in practical words means that when you stir the risotto, you notice that it’s consistency has changed like it’s glued together. In Italy we eat risotto al dente (not cooked thoroughly) and I taste it once I see that it soaked up the liquid. If you prefer rice cooked well, continue adding broth until you cook it to your desired consistency. Make sure you always add a small quantity of broth as you don’t want to make it watery once you arrive at the finish line. 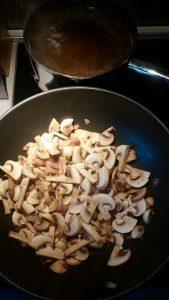 Last step for Risotto with Mushrooms – Mantecatura (learn this Italian word) we do it every time to finish up a risotto. 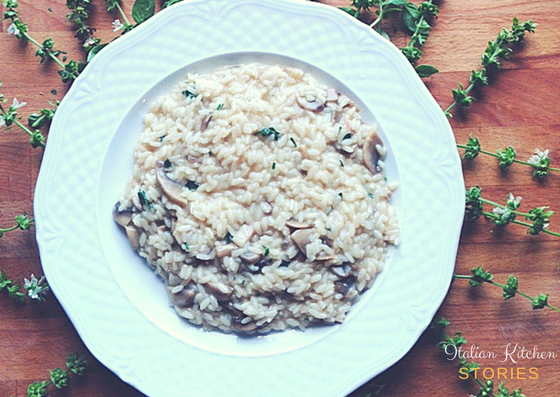 Once your risotto with mushrooms is cooked to your desired consistency turn off the stove. Add a cube of butter and continue stirring until all the butter is melted. You will get super creamy rich texture. Let it sit for one minute, garnish it with chopped parsley and then start serving it on the plate. Butter – I don’t know the quantity in grams. I use it with common sense. Parsley – I picked this small branches from my balcony. I Love it fresh!!! TIP: You may have noticed that I didn’t mention salt in the whole recipe. That’s because in Italy we make broth to our specific taste and we add salt there. So during the cooking of risotto we don’t add salt. If you desire, you may add pepper at the end of your preparation. 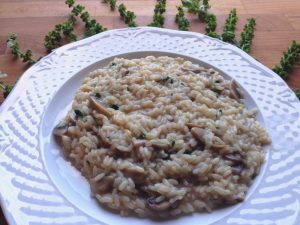 Easiest Risotto recipe I have come across, going to try it tonight. Thank you Daisy. Let me know how did it come out. Feel free to share a pic with me. :-) Buon Appetito! Great recipe! I'm definitely going to pass along your blog to my mom - I'm half Italian (she's full) and she's the cook in our family. Thanks!